Over at PS3News, zoned has released a simple program to watch AVCHD movie files with subtitles from your Jailbroken PS3 system using your external USB devices. Here is a program I created called Simple AVCHD Manager v0.1 based on Open Manager and for use on JailBroken PS3 consoles. From the ReadMe File: "Based on Open Manager. Thanks to all who have been involved with creating and fixing it. This is for use with USB devices that contain directories of movies processed with the windows AVCHD manager, it allows the selection of the movie for viewing under the XMB with subtitles if available. If you dont know how to get your videos into AVCHD format use google. Scans connected USB devices for folders processed by the windows AVCHD Manager. Any current AVCHD folder is automatically changed to the movie name as defined in details.txt. Changes the selected movie directory name to AVCHD to allow playback through XMB. Displays custom cover/screenshot icon "ICON0.PNG" if present in the movie directory. Resolution up to 320x176 supported. Allows deletion of movie directories. No FTP or copy mode as I do not see the point when you can just connect your usb device to the pc and copy files that way. No ability to copy to internal drive as AVCHD files do not work from there. This is only version 0.1 as there is more work needed to the code to remove unnecessary portions." 4) Source mkv video file. 3) Goto split and cut option and ensure it splits large files. 11) Repeat steps 1 - 9 for other video files. Plug USB device into the PS3 and it will detect the AVCHD folder. Goto video to play it with subtitles and DTS working. 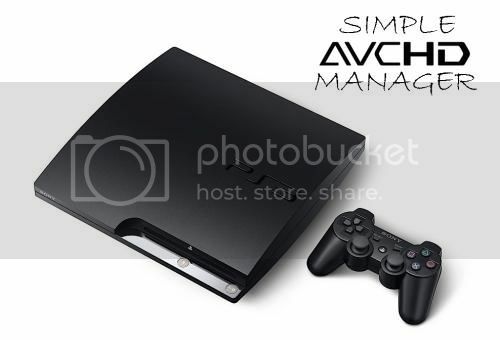 On a JB PS3 you can use Simple AVCHD Manager to change the default video without needing to unplug the usb device.